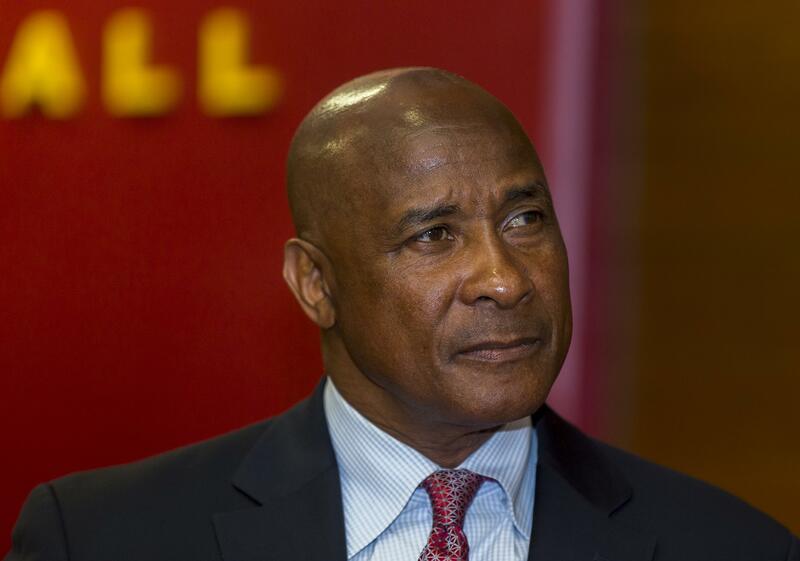 LOS ANGELES – When Lynn Swann was hired out of nowhere to become USC’s athletic director in April 2016, his lack of major college administrative experience was brushed away with a promise. After three years, it is a promise broken. With two scandals that drew FBI investigations having occurred under Swann’s careless and chaotic watch, the Trojans’ heart has been damaged, its soul tainted, and it’s time for a change. In the wake of news that his program endorsed the admittance of fake athletes, it’s time for USC to retire Swann and find a real athletic director. Swann needs to go, now, for the sake of a world-class university with an otherwise sterling academic reputation that has been soiled by an athletic director who behaves like a dummy. Athletics used to be one of the school’s major selling points. It’s now an embarrassment. The national success of Trojans teams used to attract the smartest of kids longing to study at the coolest of places. Now, surely, the thought of going to a school where admission could be gained with a fraud photo and a fat check makes a National Merit semifinalist think twice. USC’s academic reputation is spiraling because of athletics, and that’s on Swann. He has made many mistakes before this and, despite much criticism in this space, he has been given a pass by many longtime Trojans fans because he’s a school great and Pro Football Hall of Famer and all that stuff. None of which should mean anything when it comes to the mechanics of running a big-time athletic program. But at USC it still does, and that’s part of the problem. Swann was somehow forgiven his surprising retention of football coach Clay Helton. He was inexplicably excused for allowing offensive coordinator Kliff Kingsbury to hijack his football program while he found a better job. Folks only raised eyebrows when he banned the Song Girls from performing at home basketball games. The lack of success among the football, basketball and baseball teams could be blamed on the coaches. Even the perception that Swann cares more about playing golf than running an athletic department was treated with whispers. Then, this week, everything became exponentially uglier with news that four USC athletic employees – including the No. 3 person in the department – allegedly accepted nearly $2 million in bribes to get students into school. This is not a whisper. This is a shout. This is a cry for help that should be heard to the heights of USC’s sagging ivory tower. Something is terribly wrong here, and that something is Lynn Swann. There have been two announced FBI probes into college sports in recent months. Only one school was cited in both of them. USC. In the last 18 months, of five USC current or former athletic department employees who have been arrested by the FBI, three of them worked under Swann. First, there was Tony Bland, the USC assistant basketball coach who recently pleaded guilty to one count of conspiracy to commit bribery in connection with the college basketball corruption scandal. Now, this week, Donna Heinel, a senior associate athletic director, was alleged to have accepted $1.3 million in bribes, and Jovan Vavic, the famed men’s and women’s water polo coach, was alleged to have accepted $250,000 in bribes. There were two others, both former USC soccer coaches, charged in this scandal – Ali Khosroshahin and Laura Janke – who were either fired or left the school before Swann’s arrival. It seems like the problem isn’t with what Swann did. It’s with what he didn’t do. It boggles the mind what he didn’t do. The No. 3 official in the athletic department is pushing fake recruits through the system and the athletic director never notices? Granted, these were all purportedly nonscholarship students, but Swann has basically no idea who is entering school through his doors? Three were fake football players, including a “kicker” who had no idea how to kick and a long snapper who never played in high school. Seriously? Football is Swann’s main responsibility and he never looks at who is being admitted as a football player? Some were fake basketball players – small, uncoordinated ones – and it is truly a march toward madness when an athletic director doesn’t know who enters school under the cover of his second-most celebrated program. It doesn’t feel like a coincidence that most of the bribed admissions occurred in nonrevenue sports, including water polo, lacrosse and crew. It’s possible that Swann just ignored those teams entirely. Even if Swann did not touch this, his lack of fingerprints is damning. “The government has repeatedly informed us that it views USC as a victim,” Austin wrote in an open letter to the USC community. Sorry, you can’t play that card here. The victims are the deserving kids who were rejected from your school because of spots taken by the entitled phonies. The victims are Southern Californians so invested in your school through your sports teams that they have made “Fight On” a mantra for their lives. USC athletics has abandoned these people because Swann has ignored these people, and they deserve better from both. They deserve an athletic director who does more than shake hands and raise money. They deserve a savvy administrator who can lead a program in an era in which college athletic departments are actually giant corporations. They need a CEO, not a football hero who goes AWOL. There is belief among USC insiders that Austin doesn’t feel her “interim” title gives her the power to replace Swann. The perception is that the university would rather wait until a permanent president is hired before any housecleaning would occur. If that is true, then they need to change Austin’s “interim” title to “vacant,” because only a university completely devoid of leadership would continue to allow Swann to lead. Published: March 16, 2019, 1:26 p.m. Updated: March 16, 2019, 4:32 p.m.